I have now experimented with a stronger vat, this time using 2 teaspoons indigo, 4 teaspoons calcium hydroxide and 6 teaspoons fructose – that is, double the quantities used in my first vat. If anyone else has any comments to add on using this type of indigo vat, I’d be delighted to receive them. 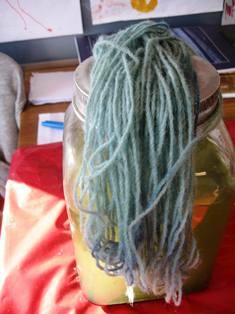 I have read several times about Michel Garcia’s indigo vats – in reports from the ISEND natural dye conference in France, in posts on Helen Melvin’s blog and most recently in an article by Jane Deane in The Journal for Weavers, Spinners and Dyers. 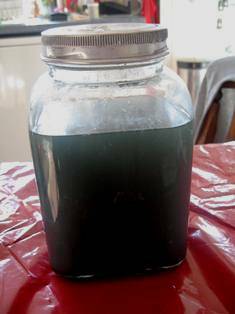 Michel Garcia is a bio-chemist who has been researching indigo dyeing for many years and he has developed indigo vats that are simple to make and ready to use in a short space of time. 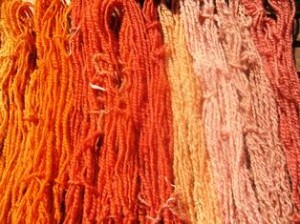 Michel wants his environmentally-friendly methods to reach as many dyers as possible, so I decided to try out one of his recipes and then pass on the information, so others can use it too. 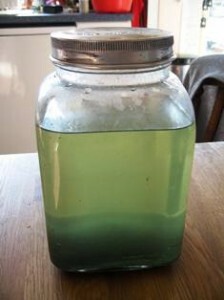 The vat I have tried is his 1-2-3 vat, so called because of the proportions of the ingredients used: 1 part indigo, 2 parts slaked lime (calcium hydroxide) and 3 parts fructose. This means that for 10gm indigo you would need 20gm calcium hydroxide and 30gm fructose, for 20gm indigo you would need 40gm calcium hydroxide and 60gm fructose and so on. Calcium hydroxide or slaked lime should be available from builders’ merchants but I bought mine on the internet from Amazon. I purchased fructose from our local health food shop but it may also be available in some supermarkets. For my trial vat I used 1 teaspoon indigo powder, 2 teaspoons calcium hydroxide and 3 teaspoons fructose. NB Calcium hydroxide should be handled with caution. It can irritate skin and lungs and cause serious injury if it comes into contact with the eyes. Do not pour water onto it but add it slowly to water. Add this indigo solution to the hot water in the vat or jar, then stir in the calcium hydroxide. Finally add the fructose and stir well. The vat may take up to 45 minutes to be ready but mine was ready to use in about 5 minutes. The vat can then be used in the same way as other indigo vats. One recommendation was to add the fibres dry, rather than wetting them first, but I forgot this and wetted out my wool skein automatically, as I usually do, and it didn’t appear to matter. I suspect this recommendation probably refers mainly to cotton and silk fabrics, which I often add dry to indigo vats anyway. 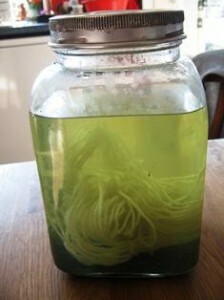 Another suggestion was that the pH of this vat might be too high for wool. However, my vat was pH11 but I dyed wool in it without any obvious ill effects. 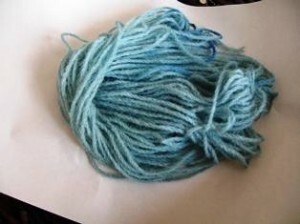 The wool remained in the vat for about 30 minutes and dyed to a mid-blue; further dips didn’t increase the depth of blue. I also added some silk fabric and a cotton skein to the vat and both dyed to a similar shade of blue as the wool. Jane Deane’s article implies that this vat is likely to produce only pale to mid blues but the lack of a deep blue from my vat may have been because I only used 1 teaspoon of indigo to make this trial vat. 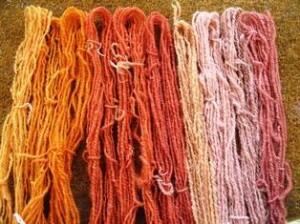 Anyway, I shall experiment further with this method and see whether deep blues can be achieved. I found this method of indigo dyeing extremely simple and effective and, if it also dyes deep blues, it could be very useful.